Wash and clean out chicken cavity, rinsing out any impurities. This will give you a cleaner broth, which you poach. Pat chicken dry, Season whole chicken generously with salt, inside and out. Stuff the chicken with the ginger slices and the spring onion. Place the chicken in a large stockpot filled with approximately 8 cups of cold water. Bring the chicken in the pot to the boil over high heat, then immediately turn the heat to low to keep at a simmer. Cook for about 45 minutes. Ensure you skim the broth during cooking, for any impurities. Remove pan from heat and stand for 1 hour, covered (chicken will continue to cook in residual heat). Reserve all of the poaching broth. While chicken is cooling, make the chilli sauce by mixing the ingredients in a blender until smooth and bright red. Set aside. Cook the rice according to package directions, using the reserved poaching liquid instead of water. While your rice is cooking, pat dry chicken with a paper towel. Rub the outside of the chicken, very lightly, with the sesame oil*. Remove skin from chicken. Chop down the middle & remove backbone. Remove the drumsticks and set aside. Carefully remove the chicken breasts for slicing. Remove the carcass and rest of the meat from the bones and chop into approx. 6 pieces. To serve, place pieces of chick underneath, using a serving board or platter, adding sliced breast meat and drumsticks on top. 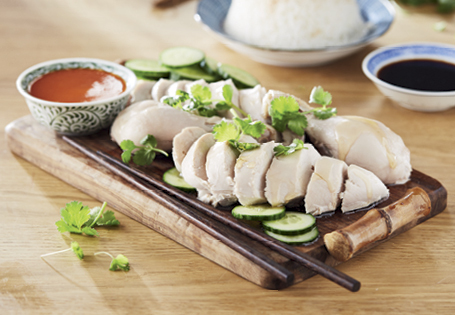 Garnish with sliced cucumber and sprinkle with fresh coriander. Serve with dipping sauce and rice. *Tip: you can mix your sesame oil with soy sauce to use as a final tasty rub for the chicken, before serving.